So I opened up this box that arrived at the Cathy C. Hall house and wheeee! 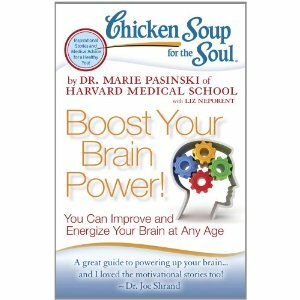 It was Chicken Soup for the Soul Boost Your Brain Power! And yes, I am rather fond of exclamation points, but that exclamation point in the title was put there by the Chicken Soup people, not yours truly. Though I am all for boosting brain power and honestly, I would’ve probably added an exclamation point had there not been one. Anyway, perusing this book (not just my own story with my personal method for boosting brain power) made me feel lots smarter than I did when I woke up this morning. So wheeeee again! But I would caution you against feeling too smart. Because that is just when you get your comeuppance. For me, it came up with a map. Specifically, I realized (this afternoon) that I would need a map of the town that’s protrayed in the novel I’m working on. Which shouldn’t be that difficult. But anyone who has ever driven in a car with me–or walked in a neighborhood–or heck, been in a really big building–knows that I have this “issue” with maps. I can’t follow ’em. That might make drawing a map a bit of a problem. But I’m going to double check in my Boost Your Brain Power! book, see if anyone wrote a story about that. Because there are some seriously smart people in Boost Your Brain Power! I think exclamation points and maps are great all around. We have enjoyed your story in Messages from Heaven! (I added that exclamation point.) In my haste to prepare for a conference, I misplaced or recycled the packaging and failed to send you a proper note. So. I am here saying it now. Thank you. Congratulations, Cathy. My husband says I always have my map upside down. Thanks, Linda. You know guys invented maps, don’t you? Which is ironic since guys never use them. Gosh, I need a nap, too. I was up late last night, killing spiders. And opening that box to get out the smart book sounds exhausting. You must be plumb tuckered out. I don’t know how you have any energy left to talk about reading maps…(! )…never mind. Now I’m gonna have to go read about the spiders, Val…did you do that on purpose???!!! Congratulations, Kathy. Wow! You are on a roll. Lonnie Whitaker, a local writer from these parts is in the same anthology. He wrote a piece about how playing the banjo keeps boosts his brain power. Thanks for the congrats, y’all. It was a strange summer…I did nothing but query agents (Complete rejection) and submit Chicken Soup stories (Complete acceptance).